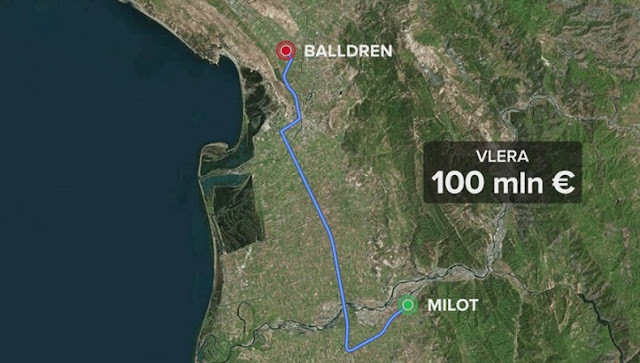 Following the Arbri and Thumanë-Kashar Highways, the Albanian Government has announced the winner for the third major infrastructure concession - Milot-Balldren Highway. The Ministry of Energy selected the ANK company, with sole owner Agim Kola, as the concession winner in the amount of € 161.5 million, for the construction and maintenance of the Milot-Balldren road. Upon completion of the tender, the Ministry of Energy and the company will negotiate the contract and only after the negotiation will be announced the final value of this project. According to the tender documents, the company ANK will build the axis 17.2 kilometer long from Milot to Balldren with its own money and will then be repaid from the state budget in installments for 13 years. Initially, the cost of Milot-Balldren Street was projected 50% lower. In relation to the state budget for 2018, the government has set as a total fund for this route the value of Leks 14.2 billion or about 113 million euros. But 7 months later the cost rose to 161.5 million euros. According to the Ministry, the reason was the change of the project of this work,and now is included the construction of secondary exit roads. Milot-Balldren is the third work of the 1 billion-euro package, born as an undecided concession, not as a government project, but proposed by the ANK company itself. Also this time, as in the previous two times, the tender was won by the company that has made the unsolicited bid of the concession. Earlier, the US State Department publicly voiced concerns that these concessions limit competition by predestining the winners, while the International Monetary Fund urged the government to shut down the 1 billion-euro program as risky for state finances.